Definition - What does Crescent Moon Pose mean? Crescent moon pose is a lunging asana that strengthens the legs, thighs and hips, firms the abs and can help with weight loss. In low lunge, the front leg bends at a 90-degree angle and the back knee lowers to the floor, with the top of the foot on the floor. The torso lifts up and the arms reach overhead as the tailbone presses downward. The drishti (gaze) is to the fingers. Repeat with the opposite leg. To deepen the pose, arch the upper back. Crescent moon pose may also be referred to by its Sanskrit name, Anjaneyasana. Crescent moon pose is a great asana for beginners as it is accessible to a wide range of physical capabilities and body types. 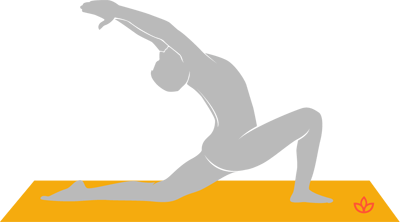 Variations on this pose include lowering the back knee to a blanket on the floor or keeping the hands on the front thigh instead of reaching overhead. To deepen the pose, arch the upper back. If low lunge strains the knees, a folded blanket can be placed under the back knee. If stretching the arms overhead is too advanced, the hands can rest on the hips or in prayer pose. For better balance, it is recommended to practice the pose against a wall at first, with the front foot and fingertips pressing against it. Low lunge benefits the heart as well, which makes it a great pose for runners, hikers and cyclists.